Though I didn’t win a trip to Napa, I wanted to thank all of you who showed up and voted for me and for my chocolate truffles. I was very honored to be in the final top 10, standing among such talented bloggers. Thank you very much! You have been so good to me. And for last week Chocolate Sparklers Giveaway, I really wish I could send each and every one of you a gift. But, in the end, there can be only one-- so Congratulations to Brilynn. She will be receiving some edible love in her mailbox very soon. As for the others, there will plenty of edible love in the future. Today’s recipe is probably the first dessert my mother has ever allowed to cook, all by myself. I had gone from peeling bananas and oranges for the fruit salad to actually cooking something; even if all I had to do was stirring never endings “eights” until my mother would say it’s done. In the life of a little girl, and aspired cook, this was a big achievement. Over the years, this pudding had become my signature dessert. The one I would make when there was no dessert at all—or as my mother says: “You want some desert?” the one I would quickly whip up for some unexpected guests, the one I would turn to, at the end of the week, where all we had in the fridge was milk and two eggs. Chocolate was always present in our pantry. It’s a basic chocolate and vanilla pudding, cooked in separate pans, on a low heat and thickened with the use of cornstarch. The vanilla layer is usually flavored with a teaspoon of orange blossom water. 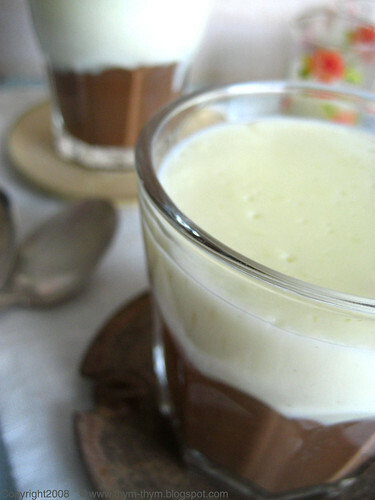 But I didn’t know how this latter will taste like with the use of chili powder in the chocolate layer. I preferred to play it safe. This time. In a heavy saucepan, mix sugar, egg yolk and cornstarch. Slowly add the milk. Cook over a low heat while stirring constantly to avoid lumps. When the mixture starts to thicken, about 10 minutes, remove from the heat, add the vanilla extract and whisk until well incorporated. Strain through a fine mesh to remove any lumps and pour into individual ramekins or a big ramekin. Set aside. Clean your saucepan. Follow the same instruction as for the vanilla pudding. Just when the mixture starts to thicken, add the chocolate, the chili powder and continue stirring until smooth and thick (about 2 minutes). Pour slowly over the vanilla layer, starting from the edges and going to the center. Cover with a plastic wrap direct on the surface of the pudding. Chill. Dans une casserole a fond épais, mélanger jaune d’ouef, sucre et maizena. Ajouter le lait doucement et continuer à mélanger. Mettre sur feu doux et faites cuire sans cesser de remuer afin d’éviter les grumeaux. Dés que le m élange commece a épaissir, environ 10 minutes, retirer du feu et y ajouter la vanille. M élanger pour bien l’incorporer et passer au chinois en cas ou il y’aurait des grumeaux. Verser dans vos ramequins et mettre de coté. Netoyer votre casserole et proceder de la même manière que pour le précédent. Au moment ou le mélange commence à s’epaissir, ajouter le chocolat et le piment. Continuer à mélanger jusqu’à ce que le pudding redevienne soyeux et épais, environ 2 minutes. Verser sur la couche de vanille en allant des bords vers le centre. Si vous versez directement au centre, cela va penetrer le pudding à la vanille. Such a classic and classy looking dessert. That looks so simple and so beautiful. Gorgeous! Oh I've been having such pudding cravings lately. I can't wait to make this. Lovely dessert -- and it must be delicious, or it wouldn't have been your favorite since childhood! I'd love to try this. I remember stirring 8's also! In my mind that is the only acceptable way to stir pudding! This looks very good, and I do love a good pudding! Oooh this looks so pretty. And it must be delicious too. I think I'll give it a try! I've been wanting to make chocolate pudding for a long time now. Pierre loves the Mont blanc pudding and I'm sure this is even better. Thank you for this recipe :) I hope you're braving the weather okay! So, one can have it either black and white or white and black! Pour ton concours,l'essentiel c'est de participer .Pour nous tu es la meilleure. your blog is delicious warda. i enjoyed the french links although my french is poor. chocolate and chili is great ! Even if I prefer chocolate & "cumin"
mmmm, i love pudding! now i have a total craving for pudding or custard! Dorie has a split level pudding recipe in her book that I've been meaning to try out for ages, after seeing yours I definitely want to make them! Wow--neither pudding require much sugar, either! - Cheryl, thank you. Sometimes classics can't be ebaten. - Joy, welcome! I am glad you like them. - Robin, who can't resist pudding cravings? Not me ;0 Hope you will like it. - Lydia, thanks a lot my dear. Can you believe it if I told you that I have never tied other recipe than this one! To me, it's simply my favorite. - Gretchen, hahahaha, you are so right! Even when my husband tries to help me, I ask him to stir 8's not 0's, because in my mind it's the only way to have a smooth pudding, sauce or whatever. - Sues, thank you!I hope you will enjoy it. - Christine, it's been ages since I had the Mont Blanc Pudding. They are so good and silky. I don't know if mine are better. Delicious? yes! - Mima, il faudrait que j'attende que ma petite fille grandisse un peu avant quu lui cede mon tablier. Merci ma chere et tendre mima. Tu as toujours les mots les plus doux. - Marion, you are more than welcome my dearest friend. Chocolate and cumin? I have never heard of it! Is it good? do they sell it in a chocolate bar? - MrsPresley, thanks! I will try to answer your meme. 25 things a bout me? Now that's a lot. - Brilynn, I am sure Dorie's pudding is even better. Looking forward to seeing it on your blog. - JEP, I like it when it's not too sweet! You can really taste the chocolate and the spices. Sometimes one forgets how the simplest of things can bring the most joy in life. Thank you for the pudding recipe. And congratulations on you blogiversary! My mother made something very similar when I was little. Looks wonderful! - Sarah, thanks! You are absolutely right! We should be reminded to take a pause from time to time to enjoy these moments. 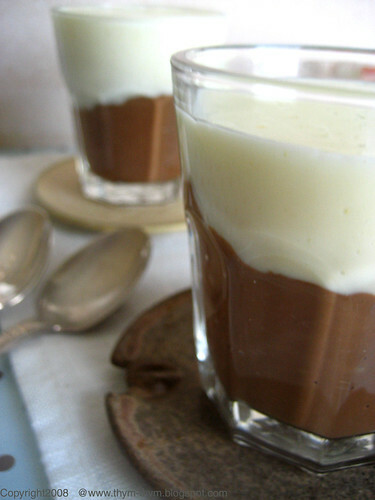 - Sherry, it is funny to see how a simple pudding brings so much childhood memories. - Helene, thank you very much! Sunday afternoon - in my kitchen - making black and white pudding - what a treat!